Control mode: Auto,Sound-activatedIntelligent automatic sound sync sensor – The light effect will change according to the music. In addition, support for remote manual operation. Super stylish and Reaction Design – The lighting device has been made more reliable and durable electronics materials, the outer glass cover and a lasing beam that will provide the best lighting experience. Support remote control and sound control – Bluetooth, SD and USB ports modes for options; Come with a small USB Disk( Under 1M, included several classical English songs, as a small gift). 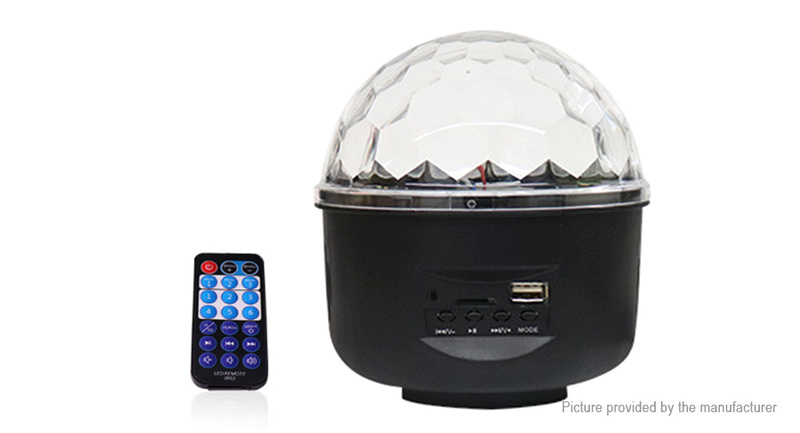 This magic ball can absolutely shock you eyeball with colorful lighting, Suitable for family, party, KTV rooms, dance halls, bars, weddings and birthday parties, disco, ballroom, stage, club, holiday, new year party, wedding, show, pub, DJ, etc.